Have a blooming night on the town! Can't find an event near you? Join our Event Exec Program! Grab your gals or beau and join us at Uptown Wine & Beer Bar for a night of floral arranging fun! Sip on wine, beer or cider (included in your ticket) while learning tips and tricks for floral arranging! Alice's Table & Hilliards Chocolates have collaborated to offer a perfect girls night out! Come learn the art of flower arranging, while sampling organic wine and fine crafted chocolates. At the end of the evening, you'll take home new floral tips and tricks, along with your seasonal flower arrangement. Join us for this BYOB, 2 in 1 class at Give Me Some Sugar! First, learn the art of floral arranging and take home your custom flower masterpiece. Then, get your sugar rush on by learning to decorate 6 delicious cupcakes to take home. 2 classes in 1 - flowers and cupcakes? What could be better! Come celebrate Spring with us at We Olive and Wine Bar in the historic Houston Heights! Food and drink will be available for purchase, so come hungry and taste all of the wonderful things We Olive has to offer. Grab your bestie and come to Harmonic Brewing to learn the art of floral arranging! Ticket includes beer, snack and gratuity. It's a flower party at Tuscan Kitchen Portsmouth with Alice's Table! Call the girls and sign up now as tickets will sell out quickly! You'll learn the art of flower arranging while sipping on Sangrias or other tasty cocktails(available for purchase)! Celebrate Mother's Day with your little ones. Join us for a fun Mommy & Me afternoon at The Picket Fence where you'll assist your little one in making a beautiful flower crown. This event page is for one child flower crown! Grab your besties and celebrate the season at Rosebud! Sip on a cocktail while creating your stunning Spring arrangement. Let your creative side bloom and take home your gorgeous centerpiece. What better way to Welcome Spring, than with a Spring inspired wreath for your front door, or inside your home. Made with fresh herbs, not only is this wreath beautiful, but it smells just as good! Enjoy a complimentary pour of DeLille wine with your ticket. Grab your girlfriends and join Alice's Table for a fun filled night learning the art of floral design by creating a spring flower arrangement! At the end of the night you can take home your beautiful creation along with tips and tricks! Light snacks & Sangria will be served. Join us at Le Gourmet Bakery for tips on how to make your Cocktail Party or Happy Hour Fabulous! Enjoy a complimentary Clean Crafted Wine Tasting from @teamvinemamma, watch a demo on assembling the perfect cheese tray and learn tricks on floral arranging. Do you have a Crush on gorgeous seasonal blooms?! Come arrange your own bouquet at Crush Boutique on Charles St. You'll pick up tips and tricks that will keep your flowers looking fresh. Browse the spring and summer styles at Crush while enjoying some bubbly and snacks. Are you DTF: Down to Fiesta? Grab your senoritas and come pre-celebrate Cinco de Mayo with a floral fiesta collaboration between Alice's Table and El Sarape! During the evening let's "taco bout" vibrant blooms, all while learning new floral tips and tricks. Grab your family and friends for a fun-filled evening celebrating Spring at Back Bay Brewing Co! Let your creative side bloom as you join us in a floral arranging workshop featuring fresh, spring blooms! Grab your girlfriends and join us at Best Dressed for the most stylish event of the year! Enjoy wine and treats while you create a beautiful Spring floral arrangement. Guests will receive 20% off purchases made that evening. Find an outfit for your upcoming soirée and bring home your centerpiece in a chic new vase! Celebrate Spring with fresh floral blooms and unique fashionable finds. Grab your besties and join me in the beautiful village of Edgewood where you'll learn how to create and take home a gorgeous handmade arrangement. Come join us at the stunning Watershed Lake House in Tempe where you will learn the craft of floral arranging as we create a show stopping spring floral centerpiece! Conveniently during happy hour to enjoy the Watershed's delicious drinks and apps for an awesome price! You won't want to miss out on this party! Join us Catrina's Tequila & Taco Bar for a Girl's Night Out! Learn the tip and tricks of keeping your flowers staying fresher. While at Catrina's enjoy some real authentic Mexican cuisine and Infused Tequilas. Grab your daughter, niece, or special little lady and join us for a morning of flower crown making! Create a beautiful flower crown in studio while spending time with your loved one, just in time for Mother's Day! Complimentary mini photo sessions will be available during the event! And they're off...to a fabulous day of flower crowns and shopping at Ouimillie! Enjoy complimentary brunch bites and cocktails while you create a stunning fresh flower headpiece to wear at festivities all day long! Grab a friend and join us for a blooming flower arranging workshop. Learn some great tips and tricks on how to work with fresh cut flowers. At the end of the event, take home your hand crafted beautiful arrangement! Grab your girlfriends, sisters or mom for a unique floral arranging workshop at West Elm! At the end of the afternoon you can take home your beautiful creation along with tips and tricks. Special West Elm discount for all participants! We are flowing into Baltimore's 100 year old Flower Mart weekend with a wonderful flower arranging class in tribute to Nancy, namesake of this fun and fabulous venue! Grab a friend and join us in the cafe. Ladies and Gentlemen are welcome! Create a Mother’s Day floral centerpiece to enjoy yourself or bring to your mom, daughter or friend. Dads, bring your daughters and surprise their mother with a special gift. Enjoy Jazz, then shop around for an awesome gift from St Charles Town Center. Bring your Mom, daughter or bestie and make a beautiful Mother's Day arrangement. No experience necessary - we will bring all the equipment and supplies and teach you how to make a florist quality flower arrangement that you will take home at the end of the night! Flower Crowns and Photo Shoot! Get ready for a special morning for moms and daughters! Work together to create a kid-sized flower crown with fresh flowers. Then, share a bubbly toast (lemonade for girls, champagne for moms!) Head over to the gardens for a mini-photo session by Michelle Marie (www.michellemarie.co). Come celebrate your Mum with us at glassybaby for Mother's Day! Enjoying sipping on a complimentary Mimosa out of your glassybaby drinker (included in your ticket price), while learning the art of floral arranging! What better way to kick off Spring than with a floral arranging workshop at Tapster Chicago! Bring your friends, sisters, or mother as we create a beautiful, Spring themed arrangement while enjoying drinks and laughs! Drinks will be available for purchase. What better Mother's Day gift than a floral arranging class! Treat Mom to an afternoon of relaxation and fun - learning floral tips and tricks along the way. Or come make an arrangement to give your Mom, sister, or friend for Mother's Day! Join us at Willamette Valley Vineyard's Tasting Room in McMinnville as we celebrate Moms! Give Mom a Mother's Day to remember with an afternoon filled with wine tasting, charcuterie, and flower arranging. Come together to create a Centerpiece with mom or for mom! Enjoy an appetizer along with a toast for a fabulous night out, all included in your ticket. Celebrate your mom, grandmother, daughter, friend, or sister at The Flying Bridge in Falmouth at this pre-Mother's Day event! Enjoy waterfront views of the Falmouth Harbor while creating your own gorgeous centerpiece to take home. Create a Mother’s Day floral centerpiece to enjoy yourself or bring to your mom, daughter or friend. We will have some sweet treats and lemonade to enjoy. BYOB as always! Then shop in the store for an awesome gift from Athleta and enjoy a 20% discount. Come together to create a centerpiece with mom or for mom! Enjoy an crab cake or steak skewer along with a prosecco, all included in your ticket. At the end of the night bring home your unique creation! Grab the girls...Cinco de Mayo calls for colorful blooms and sipping on margaritas! Join Alice's Table at Nosh & Grog Provisions for a festive flower event. During the evening you will learn how to create a vibrant flower arrangement while learning new tips and tricks. Come celebrate an early Mother's Day with us at UNO Pizzeria & Grill in Dedham! Spend the night with the most important ladies in your life for a fun night of food, drinks and flowers! Create a gorgeous spring arrangement to take home for yourself or to gift to the woman in your life. Enjoy some drinks and grab a bite to eat from UNO's delicious menu! A Blooming Good Time with Mom! Join us for a night out to celebrate the bond of Mothers and Daughters! Learn how to make a floral arrangement from an expert and take home some tips and tricks of flower arranging. Food and beverage are available for purchase! Petals & Pours at the Oak & Brazen Wine Co.
Let's raise our glass to the amazing mothers in our lives! Grab your mom, sister, bestie or special lady in your life and have her join you for a girls night out. Learn to create a breathtaking arrangement with high quality flowers. Two glasses of the finest craft wine are included in your ticket price. Looking for the perfect Mother's Day gift or want to treat yourself? Grab your mom, sister, bestie or special lady in your life and have her join us for an evening of flower arranging! Guests will create a beautiful centerpiece using fresh blooms. Space is limited so register today! Join us for a fun flower arranging class celebrating the Mother's in our lives! Enjoy 15% off your in-store purchases during the event! At the end of the evening, take home your beautiful arrangement in a Sugarboo Vase as well as any other must-have in-store find! Friends of Chelmsford, come support the Association of Chelmsford Theater (ACT) for a special night of fundraising, friends, flowers and fun! This fundraiser event will help you put together a gorgeous, seasonal floral arrangement that will brighten up your home. $10 of each ticket will go to the fundraising efforts. Join us at the Golf Club of Dublin to celebrate Mother's Day with your little ones! Grab your daughter, niece or special little lady and create a fresh flower crown for them! You then will be styled with a floral accessory and will enjoy a mini photo shoot with your little one! Come together to create a flower centerpiece with mom or for mom! Enjoy appetizers along with a toast of Champagne for a fabulous night out, all included in your ticket. Wine will be available for purchase. At the end of the night bring home your unique creation! Join Alice's Table for a fun filled night learning the art of floral design by creating a spring flower arrangement! At the end of the night you can take home your beautiful creation along with tips and tricks! Enjoy half off wine and 10% off your food bill! Celebrate this Mother's Day with someone special - or treat yourself to the ultimate flower arranging experience at Pandora. Who doesn't love being surrounded by elegant jewelry and blooms - just for you! Join Alice's Table for a wonderful evening of learning a new skill - flower arranging! No experience is necessary and you will take home a gorgeous flower arrangement perfect for Mother's Day. Bring your Mom, friends and family for a fantastic evening! Skip the store bought bouquet this year and bring Mom out for a night of floral arranging together at Gaslight Lynnfield! Learn how to create a beautiful spring flower arrangement and bring it home in a chic new vase. Come early or stay late and enjoy the delicious food and wine that Gaslight has to offer! Bring your mom, sister and best friend to celebrate all the special women in your life with a fun-filled flower workshop. A light afternoon tea will be provided. A portion of your ticket price will be donated to the Jupiter Inlet Lighthouse & Museum. Join us at Trillium Brewery as we celebrate Moms! Give Mom a Mother's Day to remember with an evening filled with floral arranging fun! Grab a drink from Trillium's acclaimed beer menu as you catch up with Mom and learn some fun DIY tips to make your blooms thrive. Join us at this Mother's Day event - with Mom (or for Mom)! Learn step by step instructions and create your a centerpiece with (or for) mom! At the end of the event, leave with a beautiful and handmade arrangement in a stylish vase! Bring your Mom, your sister, your friends, and celebrate the special women in your life with flowers. Learn the art of flower arranging and leave with a beautiful arrangement to share with the special Mom in your life. Join us at Gratta Wines as we celebrate Mother's Day! Give your Mom a Mother's Day experience to remember with an evening filled with floral arranging fun or make one especially for that woman in your life! Ticket includes a 3 tasting flight or 2 glasses of wine - your choice! Gather the ladies in your life for a night of food, drinks and flowers. Join me at the gorgeous Hillside Country Club to create a beautiful spring flower arrangement. A glass of wine or the evening's signature cocktail is included with your ticket and food will be available for purchase. Get in the spirit of Spring with a flower arranging workshop and styling event at Splendid! Learn how to create a gorgeous French inspired arrangement coupled with a few tips and tricks to elevate your Spring and Summer wardrobe staples. Celebrate this Mother's Day with someone special - and treat yourself to the ultimate flower arranging experience at Pandora. Who doesn't love being surrounded by elegant jewelry and blooms - just for you! Learn step by step instruction on how to arrange a beautiful centerpiece. Mother's Day Blooms at Amelia's! Come and join us for a flower arranging class! Learn to create a fresh flower arrangement in a stylish vase while you enjoy a complimentary glass of wine. At the end of the night bring home your beautiful flower arrangement as well as flower arranging tips & tricks! Join us at Third Culture Coffee as we celebrate Mother's Day! Give your Mom a Mother's Day experience to remember with an evening filled with floral arranging fun! Learn the tips and tricks of floral arranging while creating a custom one-of-a-kind Spring centerpiece! Looking for a unique night out? Come and celebrate spring with a night of food, drinks and flowers at Barcelona Restaurant in German Village, one of the premier restaurants in Columbus. Grab your friends, enjoy a drink or two and learn how to create a gorgeous flower arrangement! Looking for the perfect Mother's Day gift? Grab your mom, sister, bestie or special lady in your life and have her join us for an evening of flower arranging! Guests will create a beautiful centerpiece using fresh blooms, while sipping on sangria (included!). Mother's Day Blooms at 4 Hands Brewing Co.
What better way to celebrate that special mom in your life than to bring her out for drinks and a fun flower arranging class? Try some of 4 Hands famous St. Louis brews while learning how to create your own fresh Spring centerpiece. Free beer sample included! Grab your mom, sister, bestie or special lady in your life and join us for an evening of flower arranging! Create a beautiful floral centerpiece while spending time with friends and loved ones. Spring is almost here! Join us at one of Baltimore's Best New Restaurants for a night of spring inspired flower arranging at Cosima! Enjoy wine and light bites included in your ticket. Let your creative side bloom and learn the art of flower arranging using fresh blooms. Join Alice's Table at The Waterfall Bar & Grille to learn the art of floral arranging while learning new tips and tricks! At the end of the night, bring home a beautiful arrangement to keep for yourself or gift to your favorite "Mum"! Come celebrate Spring with us at Judy Pie's in Grapevine. Never made an arrangement before? No problem - no experience necessary! Come and join the fun and enjoy a delicious slice of pie and a drink while you make your arrangement. What better way to celebrate “Mum” than a fun-filled flower workshop? Sip on a glass of wine and nosh on an amazing hummus bowl (both included with your ticket) while you learn the art of flower arranging with fresh Spring blooms. Spend an evening with friends at Hopsmith Tavern! Create your own gorgeous flower arrangement to take home using fresh seasonal blooms. What better way to celebrate Spring than with great company, beautiful flowers and delicious food & drink (available for purchase)? We’ll teach you everything you need to know about working with cut flowers and at the end of the night, you’ll have a beautiful cut flower arrangement to kick off your Mother’s Day celebrations! Give mom a Mother's Day to remember with an evening filled with floral arranging fun! Grab a glass of wine from Broken Earth Winery extensive wine list. Take home your beautiful arrangements at the and of the evening! Girls night out with Mom at Draft! Let your creative side bloom as you learn tips & trick creating your own fresh spring arrangement. At the end of the night you’ll have a beautiful vase full of fresh flowers to bring home. Moms and Mums at Tin Bucket! Bring your Mom, your sister, your best friends, and celebrate the special women in your life with a fun-filled flower workshop. Learn the art of flower arranging and at the end of the night, bring home a beautiful arrangement to keep for yourself or gift to your favorite "Mum"! Bring your mom and celebrate the special women in your life with a fun filled flower workshop. At the end of the night, bring home a beautiful arrangement that you arrange. You will also learn how to create a new cocktail to sample! Please join us for a special Pre-Mother's Day event at Bazille in Nordstrom Thousand Oaks! Learn tips and tricks that top florists use to make gorgeous lasting arrangements. You will take your flower arrangement home in a lovely vase. Join us for a relaxing morning as we teach you the skills to create a fragrant fresh herb wreath with lavender and other greens. Sip on a mimosa and enjoy biscuits and donuts from their fabulous menu (available for purchase). Enjoy time with your mom, sister or besties. This class has limited seating! Celebrate Mother's Day with us at the Vermont Wedding Studio. Come on your own, bring mom, future mother-in-law, or another special lady in your life to create a gorgeous arrangement to gift or take home. You can always buy your mom flowers but what about taking her to our Alice's Table Mother's Day flower arranging event at Applecrest Farm Orchards? Give your mom the gift of learning how to create a gorgeous flower arrangement! One glass of wine is included in your ticket! Give mom a Mother's Day to remember with flower arranging fun! Learn step by step instructions and create a centerpiece with (or for) mom! Take home your beautiful arrangement and stylish vase at the end of the event! Join us as we learn to make gorgeous arrangements with fresh, beautiful blooms. I bring the flowers, you bring the fun! Join us at the Burlington Beer Works Co-op for a Girl's Night Out filled with fresh blooms and craft beer! Learn how to create a stunning fresh spring floral arrangement from scratch while you enjoy sipping on your beer and catching up with your friends! 2 glasses of beers or wine are included in the price. Join Alice's Table and TF Brewing for a night of blooms, brews, and giving back to Best Friends Animal Society! $10 from each ticket purchased will go to benefit the homeless pets in their care. Your ticket includes one draught beer! Join me at Off The Wall DIY Studio for a special DIY experience! Gather your friends to learn all the tips of tricks of fresh flower arranging and how to create custom monogrammed boxes! Grab your mother, sisters, friends and join us for an evening of flower arranging fun. What better way to celebrate Mother's Day! Enjoy a glass of wine and treats while putting together a beautiful arrangement to take home. Join us at Lynfred Winery on National Moscato Day to create a beautiful spring centerpiece! A perfect night out with friends or bring Mom for an early Mother's Day celebration! Join Alice's Table for a fun filled night learning the art of floral design by creating a spring flower arrangement! At the end of the night you can take home your beautiful creation along with tips and tricks. Special West Elm discount for all participants! Please join us at River Hawk Brewery for blooms, brews, and giving back! Learn how to create a Spring flower arrangement from a professional and take home some tips and tricks of the trade. A portion of your ticket price will be given to St. Jude's. Create a beautiful flower arrangement FOR your mom or better yet, WITH your mom at Sugarboo & Co. at The Arboretum! Learn flower tips and tricks and shop the adorable Sugarboo collection. Enjoy 15% off your in-store purchases during the event. Treat yourself, your friends or your Mom to a fabulous floral & beauty event at Nordstrom Short Hills. Create a gorgeous floral center piece spilling with Spring blooms just in time for Mother's Day. Come join us in beautiful Grapevine and celebrate Moms! We're making that special arrangement from you or your mom. Bring your friends and family and learn all the tips and tricks to make a beautiful Mother's Day arrangement. Hey Friends of Stoughton Center, come support the Beautification Committee for a special night of celebrating MOM with fundraising, friends, flowers and fun! $10 of each ticket will go to the fundraising efforts. Bring your someone special to our collaboration event between The Collective Outdoors and Alice's Table! Come see what new designs await at their store while we arrange gorgeous blooms in vases. Snack on complimentary light bites and sip on provided libations. Mother's Day Magic - For Mom or With Mom at 404 Wine Bar Co.
Join us at this Mother's Day event - with Mom (or for Mom)! Learn step by step instructions and create your a centerpiece with (or for) mom! At the end of the evening, leave with a beautiful and handmade arrangement in a stylish vase! Spring has arrived! Come and celebrate it with flowers and friends at Spoils of Wear Sustainable Boutique. Learn tips and techniques of the art of flower arranging and bring home a beautiful Spring centerpiece handmade by you! Create a beautiful fresh flower arrangement in a preselected Sugarboo & Co. vase either to keep or gift to your favorite Mom. Enjoy complimentary sips and snacks as you shop the stores, while receiving 15% off all purchases made during the event! Join us at Vintage Charm LaGrange as we celebrate Moms! Give Mom a Mother's Day to remember with an evening filled with floral arranging fun! Sip on a beverage as you catch up with Mom and learn some fun DIY tips to make your blooms thrive. 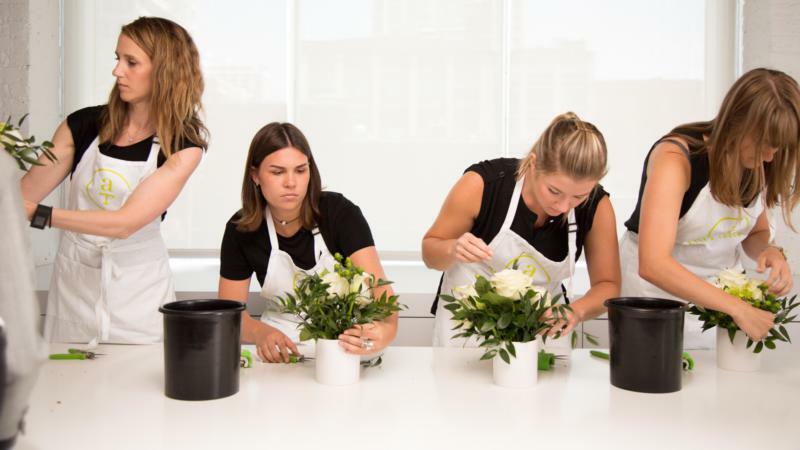 What better Mother's Day gift than a floral arranging class? Treat Mom to an evening of relaxation and fun - learning floral tips and tricks along the way. Or come make an arrangement to give your Mom, sister, or friend for Mother's Day! Grab your mother, sisters, friends and join us for an evening of flower arranging fun. What better way to celebrate Mother's Day than treating her to quality time with loved ones and beautiful fresh flowers! Enjoy a complimentary glass of bubbly while you create a beautiful arrangement to take home. Create a gorgeous fresh floral arrangement just in time for Mother's Day! Melissa and Robin will guide you step by step through the design process, providing tips & tricks of the trade along the way. Then bring your beautiful creation home with you to enjoy! Blowouts and Blooms with Mom (or for Mom)! Time for you and your table to look their best! Enjoy a blowout first, then learn step by step instructions and create your a centerpiece with (or for) mom! Your ticket includes both (tipping at your discretion)! Calling all “Mums”! Celebrate the special women in your life with a fun-filled flower workshop! Learn the art of flower arranging with fresh Spring blooms. At the end of the night, bring home your florist worthy arrangement or gift to your favorite "Mum"! Get ready for Mother’s Day and head on out to Fox and Holly for a special DIY cut flower arrangement workshop with Alice’s Table! We will teach you everything you need to know about arranging fresh cut blooms and how to make them last! Join us at Ask Aunt V and Market on Main Street as we celebrate Moms! Give Mom a Mother's Day to remember with an afternoon filled with floral arranging fun! Learn some fun DIY tips to make your blooms thrive. Come celebrate Moms at the Boca Raton Miele Experience Center. Together we will be creating a beautiful fresh floral arrangement in a chic vase. Learn a new craft alongside your mom, or you can hand make the perfect gift for her. This centerpiece will be sure to impress! Grab your mom, sister or girlfriend and join us for Bubbles and Blooms at Out of the Blue AZ for a Mother's Day floral arranging class! Enjoy the afternoon sipping on bubbles (included in ticket price) and arranging beautiful blooms! Grab your mom, sister, bestie or favorite lady in your life and join us for a special happy hour (or two) at Josephine Wine Bar. Learn how to create a beautiful spring floral arrangement from scratch while enjoying a tasty cocktail or glass of wine! Calling all Mothers! Whether you are a Mother or have a Mother, it's time to celebrate YOU! Come join us to learn a new skill and make a gorgeous flower arrangement. No experience - No problem. Join us for a night to celebrate the bond of Mothers and Daughters! Learn how to create a breathtaking arrangement with high quality flowers and enjoy all week long. An evening of flowers, poetry, music & mimosas to celebrate the season of Spring & the gifts of Mothers! Learn how to create a beautiful floral arrangement that you can take home with you at the end of the night, along with a few tips and tricks from the designer! Start Mother's Day weekend off with an event to remember. You and your child will make special memories while creating a beautiful flower arrangement together to take home with you. Each ticket will includes one flower arrangement and breakfast treats for both mother and child. Unicorn Rides & Fresh Flower Unicorn Crowns! Calling all unicorn lovers! Join me at Pony Town Parties in East Bridgewater for the ultimate unicorn experience! Learn how to create a unicorn crown made with fresh flowers and then take a ride on a real unicorn! Learn how to make a beautiful arrangement and participate in some self care at the Merrimack Valley YMCA! Discount available for MVYMCA members. Contact the branch for more information! Ticket price also includes admission to Barre class! A special Mommy and Me Mother's Day celebration at Waterlemon with your mini me! Mom (or Grandma!) and her little one will work together a gorgeous Mother's Day floral centerpiece in a new vase. Waterlemon will also be offering 10% off all in store merchandise during the event! Give your mom a Mother’s Day to remember! Join us at Swoozie’s Greensboro to celebrate that amazing bond between mother and daughter in this special floral arranging workshop. Learn the tricks of keeping your flowers staying fresher and at the end of the event take home your Mother's Day flowers to enjoy! Thinking of ways to celebrate with Mom? We've got you covered! Celebrate with us at Catalyst Restaurant. Join us for a delicious buffet brunch including one complimentary mimosa! Following brunch you'll both craft beautiful arrangements using fresh Spring blooms! Looking for a unique way to celebrate Mom this Mother's Day? Join us at Kendra Scott's UTC La Jolla store to learn the art of floral arranging, while eating light bites and sipping on complimentary mimosas. Kendra Scott is also gifting a 15% discount off of any in store purchase! Join Alice's Table for a flower arranging event to remember at West Elm Austin! Grab your tickets and learn how to create a beautiful arrangement with Spring blooms! At the end of the event, take home your arrangement along with tips and tricks of the floral trade! Grab your mom, sister, bestie or special lady in your life and join us for an afternoon of flower arranging while sipping a complimentary Mimosa or iced latte! Create a beautiful floral centerpiece while spending time with friends and loved ones. What does Mom want most for Mother’s Day? Spending some special time with you! Bring your Mom, your sister, your friends, and celebrate the special women in your life with flowers. Learn the art of flower arranging and leave with a beautiful arrangement! Enjoy a morning with friends learning how to make your own seasonal flower arrangement while hearing from Osmond's Interior Designers. Attendees will also enjoy 50% off design services for one room! Bring your mom, sister, or bestie and join us for a flower arranging event! Learn to create a fresh flower arrangement in a stylish vase while you enjoy complimentary mimosas. At the end of the event, bring home your flower arrangement as well as flower arranging tips and tricks! You won't want to miss out! Celebrate Mom with mimosas, brunch bites, and blooms at West Elm, West 7th Street! In addition, attendees will enjoy a 10% discount on purchases at West Elm on West 7th Street on the day of the event! Join us for a fun Saturday brunch with moms, mothers and hot mommas! We'll sip mimosas and create a blooming arrangement with fresh seasonal flowers! What better way to celebrate? Bring a friend to this zen-like cafe! Let’s celebrate mom all weekend with Ask Aunt V and Market on Main Street. Come together to create a Centerpiece with mom or for mom! At the end of the afternoon you will bring home your beautiful arrangement or give to that special mom on your list! Brunch & Blooms: A Mother's Day Event at The Revere Hotel! Grab your mom, aunt, sister and friends and celebrate the special women in your life with a blooming brunch at The Revere Hotel sponsored by The Glenlevit! Enjoy complimentary brunch bites and signature cocktails, all included with ticket, provided by The Glenlevit. What better Mother's Day gift than a floral arranging class! Treat Mom to an afternoon of floral arranging where she'll create her very own arrangement, or come make her one that you can give her for Mother's Day! What better gift to give your mom than a floral arranging workshop at Branches Tasting Room! She will learn how to make a beautiful fresh floral arrangement to take home and enjoy. Celebrate mom with a brunch event at the Boston Park Plaza Hotel with florals and Glenlivet! Enjoy complimentary light bites and signature drinks while you create a beautiful floral arrangement. Bring your mom, sister or friends and celebrate the special woman in your life with flowers! Celebrate Mother's Day with a little wine and flowers! Learn how to make a floral arrangement to give to a mom in your life. In honor of Mother's Day, the winery is offering a complimentary sparkling wine tasting at this event! Please join us at the Windmill Winery where we will be creating a gorgeous arrangement for that special women in your life! Join us to celebrate Mom with a bespoke floral experience at Porches Cafe. Spend the morning reveling in gorgeous fresh flowers creating a spring centerpiece. At the end of the workshop, take home a one-of-a-kind arrangement in a stylish vase, along with great floral tips and tricks. Celebrate the special women in your life with a blooming brunch at Island Creek Oyster Bar! Enjoy complimentary lite bites and party punch to kick off the festivities. Learn the tips and tricks of floral arranging while you create your own beautiful centerpiece. Grab your favorite mom and join us for some fun at Rush Creek! She'll love an afternoon out with YOU sipping cocktails and creating a pretty flower arrangement. Keep the fun going by signing up for Rush Creek's 3PM Stillhouse tour complete with samples for an additional $10.00! Join Erin Condren and Alice's Table as we celebrate all moms by learning to arrange a beautiful floral piece! At the end of the event, take home your creation in a stylish vase to keep or give to a special lady. Grab your mother, sister or friend and join us at The Princeton Miele Experience Center for a Mother's Day Celebration Centerpiece Workshop! Enjoy complimentary welcome bubbly and light bites provided along with other non-alcoholic beverages by Miele. Bring someone special with you and join us at Erin Condren for an afternoon of floral fun! Learn tips and tricks on how to create a gorgeous fresh flower arrangement. At the end, you'll take home your creation in a stylish vase as well as any other must-have in-store finds! Bring your mom or someone special and join us at Erin Condren's Store, located in the lobby of their stunning and expansive EC Creative Offices, for an afternoon of floral fun! Learn tips and tricks on how to create a gorgeous fresh flower arrangement using seasonal blooms. Get ready for Mother's Day with a relaxing flower arranging class at the amazing Hangar 1 Distillery & Tasting Room! Within an actual WWII-era hangar surrounded by gorgeous views of San Francisco, you'll craft your very own flower-filled centerpiece and then enjoy a tasting of six Hangar 1 Distillery expressions. Sand Castle Winery and Alice’s Table are pleased to invite you to a special Mother’s Day wine tasting and DIY flower arrangement event! Enjoy some wine and create a beautiful arrangement! Guests also receive 30% off purchased cases of Sand Castle's Wine. Give your Mom a one-of-a-kind Mother's Day experience! Join us at Wick-ed Candle Co. to make your own hand poured candle and a gorgeous floral centerpiece! Celebrate Mom with this 2 for 1 class and you'll also enjoy a charcuterie board paired with beer and wine. Join us at Willamette Valley Vineyard's Tualatin Estate in Forest Grove as we celebrate Moms! Give Mom a Mother's Day to remember with an afternoon filled with wine tasting, charcuterie, and flower arranging. Bring your mom, grandmom, daughter, friend, or sister and spend the afternoon making a beautiful, fresh floral arrangement for yourself or to gift to your favorite mom! Enjoy refreshments and 10% off any purchase at Blairhaus the day of the event. Just in time for Mother’s Day, bring your little one along for a Mommy and Me workshop! Work together to build a beautiful arrangement and enjoy a few added surprises. We suggest ages 5+ for this event. Are the kiddos grown? Take the class together anyway to share some time while you learn something new! Searching for a fun mother daughter experience? Join us at Rise’N Roll in Valparaiso for a special floral crown workshop. We’ll be adding extra floral surprises as well! This is an event you won’t want to miss. Space is limited so get your tickets while you can! We're at Nordstrom Galleria for a wonderful Mother's Day event. Bring your friends and family to this fun event. Learn all the tips and tricks and bring home your beautiful arrangement. What better way to spend an afternoon than with beautiful flowers! Create a Mother’s Day floral centerpiece to enjoy yourself or bring to your mom, daughter or a friend. Or surprise Mom with this fun and creative flower arranging class, while enjoying delicious brews and drinks from Seven Stills Brewery and Distillery. Treat your Mom to an afternoon of candle making and flower arranging or come make Mom a candle and flower arrangement to give her on Mother's Day! To make the celebration extra special, we'll throw in a gift from Banter & Bliss Candle Co. Celebrate Mother's Day by joining Alice's Table at Barnoa Wine Bar for a special flower event! Learn to create a breathtaking arrangement with florist-fresh flowers. Enjoy happy hour pricing on wine, beer and delectable appetizers. Let's toast the mothers in our lives! Tapas & Tulips anyone?!! Enjoy a glass of wine while designing a beautiful tulip filled arrangement to take home to Mama or that special lady in your life, including YOU! Celebrate Mother's Day with an afternoon of blooms and bubbles at Element LABS specialty bath and body boutique! Bring mom, grandma, mother-in-law, or other special ladies in your life to learn the art of flower arranging while enjoying light refreshments and shopping. Celebrate Mom in the contemporary setting of MyThai Restaurant! We'll shower mom with beautiful blooms and make a gorgeous arrangement to take home! A special cocktail pairing for each guest included in ticket price. Celebrate Mother's Day with your little ones! Join us for a fun Mommy & Me afternoon at Heritage Elementary where you will be making Spring flower crowns with your little one and taking beautiful photos at the photo booth! Give Mom a Mother's Day to remember with an evening filled with floral arranging fun! Take home your beautiful arrangements at the end of the evening and you'll be sure to secure your spot on the "Best Daughter" list! One glass of cider is included in your ticket. Celebrate Mother's Day with a floral fundraiser at Wolfie's Pub! Join Pittsburgh 50 Finest honoree Nicole Caravella to create stunning arrangements while raising funds for the Cystic Fibrosis Foundation! Grab that special someone and join us for a unique flower arranging workshop at Red River Range. Not only will you learn the art of flower arranging, but you will also get an introduction to handguns and shooting fundamentals with the chance to test out several firearms. Bring the "Mum" in your life and join us at We Olive and Wine Bar in the historic Houston Heights for a one of a kind Mother's Day event! You and your "Mum" will create one of a kind gorgeous arrangements while sipping and munching on the delicious wines and food the We Olive has to offer. What does Mom want most for Mother’s Day?? Spending some special time with you! Bring your Mom, your sister, your friends, and celebrate the special women in your life with flowers. Learn the art of flower arranging and leave with a beautiful arrangement! Have you planned your Mother’s Day yet? We’ve got the perfect Mother’s Day celebration for you! Join Spirit Medium Tiffany Rice and Alice’s Table as we celebrate those we love here in the physical as well as those in spirit. Throw in a little flower therapy and we’ve got an awesome event for you! Create priceless memories this Mother's Day by celebrating with Alice's Table and The Goat in Hilliard! Grab the special women in your life and join us in creating a beautiful spring arrangement while learning flower tips and tricks. Your ticket includes one mimosa! Celebrate Mother's Day with us by creating a gorgeous arrangement full of springtime color. Bring mom along to celebrate together, make a gift for mom, or for yourself! It's a great time to stop in, take a class, and meet some of the wonderful people who frequent the studio. Crown your Mom in a beautiful flower crown fit for a queen! Join us at Threadbare Cider House for a sunny Sunday afternoon and go home with a fabulous accessory of your own design! What better way to celebrate Mom than with a flower crown?!? One glass of cider is included in your ticket! Bring your mom, your sister, your friends, and celebrate the special women in your life with flowers at Sugar and Smoke! Learn to create a fresh flower arrangement while you enjoy a complimentary glass of mimosa and a delectable brunch in a private setting! Do something extra special this Mother's Day! Enjoy flower arranging and a complimentary wine tasting by Free Range Flower Winery (wines made from flowers, not grapes!). Come learn the art of flower arranging and enjoy a delicious wine tasting with mom or a special someone. This Mother’s Day join Alice’s Table at The Bourse! We will learn the tips and tricks to create a beautiful professional floral centerpiece. Enjoy a complementary mimosa as you sit back and relax! Wonderful food and beverages will be available for sale. Bring your family and make an afternoon of it! "THIS MOTHER"S DAY" Join Alice's Table at The Square in Sharon to celebrate the amazing bond between a mother and child! During the afternoon both mom and child will enjoy executive chef selected bites and bubbly, while learning the art of flower arranging together. Make Mother's Day a special experience at Blue Table as we spend Mother's Day crafting a beautiful herbal wreath full of lavender, rosemary, and bay leaves that will be able to grace your doorway all season long. Come with your mom or your favorite group of ladies. Looking for a fun Mother’s Day present? We’ve got the perfect Mother’s Day celebration for you! Bring your mom, sister, family and friends for this fun event. Learn the art of flower arranging and leave with a beautiful arrangement! A glass of wine or beer is included in the ticket price. Join us for a fabulous night out creating a beautiful flower arrangement while enjoying a brew from White Birch Brewing (available for purchase). At the end of the evening you'll take home your arrangement full of seasonable blooms and tips & tricks that you learn throughout the workshop. Celebrate Mother's Day on Monday with your favorite ladies! Create a fresh Spring arrangement while you sip your favorite beverage. Give a unique gift with this wonderful experience! Book your tickets today and wrap up this fun class for someone you love. Experience the art of floral arranging with this French inspired Relaxing Riviera floral workshop! Hydrangeas, roses and dusty miller blend together for a calming and exquisite creation. Learn new skills, and live a social and creative lifestyle through floral arranging workshops! Grab your favorite gal pals and join us for a fun filled night of floral arranging and lavender themed drinks! Learn how to create a gorgeous fresh flower arrangement, like the professionals, and at the end of the night take your masterpiece home with you! Celebrate your mum by treating her to an evening of fresh floral arranging for Mother’s Day! This will be a special time to spend with her as you create your own stunning spring arrangements to take home. Join us at Landmark Public House for a night of DIY floral arranging fun! Learn how to create a beautiful floral arrangement that you get to take home and dress up your table. These spring flowers will have your home smelling amazing and looking sophisticated. Toast to the moms in your life at The Squealing Pig! This is the perfect gift for the woman who has everything. You'll learn step-by-step how to arrange a stunning seasonal bouquet while enjoying a cocktail tasting. Cheers to you for finding the perfect night out! Come celebrate Spring with us at UNO Pizzeria & Grill in Braintree. Grab some friends and enjoy a fun night of food, drinks and flowers! Create a gorgeous spring floral arrangement to take home, enjoy some drinks and grab a bite to eat from UNO's delicious menu! It's Peony Season! Call the Girls ... we're heading to Stark Brewery for a Flower Party by Alice's Table featuring Peonies and other amazing Springtime Blooms. At the end of class, take home a gorgeous floral arrangement and all the tips and tricks to create amazing centerpieces. Celebrate your mother, mother-in-law, sister or friend by joining us for an Alice's Table event at Bar Rustic! What better way to show the moms in your life that you love them than by spending a night out while flower arranging. Bring your mom, your sister, your friends, and celebrate the special women in your life with flowers. Grab a glass of wine or cup of coffee and bites from Urban Alchemy’s menu. Catch up with mom and learn some fun DIY tips to make your blooms thrive! Join us for a gal's night out learning the art of flower arranging and shopping the adorable collection at Swoozie's! Gather around the table for a floral arranging experience to remember. Learn tips and tricks for successful flower arranging as you curate your own arrangement in a vase. Time for you and your table to look their best...just in time for Easter! Enjoy a blowout first, then learn step by step instructions and create your Easter Centerpiece. Your ticket includes both (tipping at your discretion)! Grab your girlfriends and surround yourself with gorgeous spring blossoms at a fun filled, flower arranging event at West Elm! Learn the art of flower arranging as well as tips and tricks of the trade. At the end of the evening you'll take home your beautiful arrangement! Gather your friends for a night out at gath•er in historic Downtown Delaware. We will be creating a beautiful spring fresh floral arrangement with flowers sourced locally from Sunny Meadows Flower Farm! Bring your own beverage and treats to enjoy during the workshop. Join us at the newest Tiki Bar and Restaurant on Folly Beach - Wiki Wiki - for a night of tropical drinks & florals! Learn how to create a professional fresh floral arrangement from scratch while sipping on a tropical libation and cheers to summer being right around the corner! Still looking for the perfect Mother's Day gift? Grab your mom, sister, bestie or special lady in your life and have her join us for an evening of flower arranging! Guests will create a beautiful centerpiece while sipping spirits from White Horse Wine & Spirits. BACK BY POPULAR DEMAND!!! Join Alice's Table at The Robin's Nest for a healing and spiritual night out with shopping, flowers and a group reading! During the evening learn, the healing power of flowers while connecting with your loved ones who have passed on through group readings. Dream about being in the south of France surrounded by beautiful flowers and tempting wine! Dream no more! Come to Devine Wine and Grill to create an arrangement inspired by the colors of the region, savor a gourmet appetizer, and gain knowledge about the wine you sip. Join Alice's Table for a fun filled night learning the art of floral design by creating a spring flower arrangement! At the end of the night you can take home your beautiful creation along with tips and tricks of the floral trade! Wine tasting, wine club memberships, and food are available for purchase. You made it to the end of the week queen! Treat yourself to an evening of fun making custom blended candles followed by a floral crown to rock all through the weekend. You'll be guided and shown all the tips and tricks every step of the way. BYOB welcome! Gather your besties and join us at Catrina's Tequila & Taco Bar for a fun evening creating a stunning Spring arrangement. While at Catrina's enjoy some tacos made from scratch and some delicious Infused Margaritas. Gift your mom a morning of Spring wreath making at We Olive and Wine Bar! Learn how to decorate a grapevine wreath with fresh greens and herbs that will last the whole season and delight your senses while enjoying a complimentary mimosa. All guests must be 21 or older. Celebrate spring with fresh blooms and a new candle! Gather your besties and start by making your own custom scented candle. While it sets, head over to the patio at Taps at Heritage where a wide variety of spring flowers await you! It's Peony Season! Gather your friends for an afternoon of flower arranging and craft beer at Bone Up Brewing. Enjoy a flight of their delicious brews, included with ticket, while you create a beautiful centerpiece highlighting the Peony. Back by popular demand! Join us in creating a beautiful wreath full of lavender & fresh herbs to adorn your door. Enjoy complimentary wine as you craft your creation. Seating is limited so grab your girls & get your tickets now! Come create your own fresh floral arrangement while learning tips and tricks to keep your blooms looking lovely longer. Each guest will use professional tools with florist quality flowers to arrange gorgeous Spring blooms in this 90 minute class. Grab a friend and purchase your ticket today! Please join us for an evening at the vineyard making a beautiful spring floral arrangement while enjoying Oregon wine and stunning vineyard views! At the end of the evening, take home your fresh arrangement and a few tips and tricks from the designer! Ladies, grab your friends and join us for a morning of fresh spring flowers, mimosas, sweet treats, and personal shopping at the fabulous Lilly Pulitzer, Easton Town Center! Snack, shop, learn the art of floral arranging and take home your gorgeous Lilly inspired centerpiece! Bring Someone Special to celebrate with a floral workshop that will keep giving! You'll learn tips and tricks while creating a beautiful seasonal arrangement. Enjoy complimentary bubbly and 20% off purchases above $250! Summer is right around the corner now and flowers are starting to bloom. Join us for our Alice's Table Flower Party and learn how to create your very own flower arrangement like a professional. Call the Girls ... we're going to a Flower Party! Please join us at the AR Workshop in Chandler where we will be creating a memorial day themed arrangement all dedicated to the red, white, and blues! We will be service mimosas & monogramming our wooden boxes! You wont want to miss out the fun! Grab your girlfriends for a fun Sunday afternoon of Roses, Rosé and shopping! Join me at Fashion Fun Pop in Whitman for a DIY flower arranging workshop followed by a private shopping experience. An Afternoon with Spring Blooms at Warriors Taphouse! Please join us at Warriors Taphouse for an afternoon with your closest friends, fresh spring blooms, and fun! What more could you ask for? At the end of the evening, take home your arrangement, floral arranging tips and tricks, and fun memories from the day! What better Mother's Day gift than a floral arranging class and a complimentary glass of beer! Treat Mom to an afternoon of relaxation and fun - learning floral tips and tricks along the way. No experience - no problem! Join us at the Wine Down for a night filled with fresh florals and wine! Glass of wine (with tax and tip) included with ticket. Learn how to create a professional fresh spring floral arrangement from scratch while sipping and catching up with your besties! Join us for a mommy morning out! Learn the art of floral arranging, while your little one enjoys 2 hours of staff supervised play at Hoot Studio, an inclusive play cafe! You will learn the tips and tricks the floral professionals use and have a stunning floral centerpiece to take home with you at the end of the event. Wine down with a fun flower arranging class in the cozy confines of Corners Tavern. Enjoy a glass of wine, light snacks (included in ticket price) and let your creative side bloom! Full Bloom at The Crane Room! Gather all your friends & family and meet up at The Crane Room for a night of floral fun! Enjoy appetizers while learning the tips and tricks to build a gorgeous fresh arrangement to take home at the end of the night. Experience the art of floral arranging with this French inspired floral arrangement workshop! Beautiful lavender roses, crisp white mums and variegated pittosporum come together to create a breathtaking display. At the end of the night, take home your arrangement and your new floral arranging skills! Join us for fun evening of flower arranging at Old Town Pour House Naperville! You will learn the art of flower arranging and pick up some flower tips and tricks! At the end of the night, take home your stunning arrangement! Bring someone special to our floral workshop - a gift that will keep giving! You'll learn tips and tricks while creating a beautiful Spring arrangement and enjoying light bites and drinks. Guests enjoy 20% off all purchases the evening of the event! Join us at Bespoke of Winchester for a blooming night out! Celebrate Spring and unleash your inner DIY maven while learning the art of flower arranging in Bespoke's gorgeous showroom. Enjoy wine and refreshments! Join Alice's Table at Texas Reds & Whites Tasting Room on a beautiful Starry Night! Learn how to design your own floral arrangement, and don't forget to taste the wine! Join us for a fun evening of flower arranging at Wooden Robot Brewery! Grab a local brew and let your floral creativity come to life with a class by the Flower Power Gals! At the end of the night, you'll have a beautiful bouquet to take home or share with friends and family! What does Mom want most for Mother’s Day-- spending some special time with you, of course! What better Mother's Day gift than a floral arranging class! Celebrate the special women in your life with an evening of relaxation and fun - learning floral tips and tricks along the way. Grab your bestie or beau and join us at Create & Escape for a night of floral fun! First, monogram your own planter box with your initials or small saying. Then, learn how to create a designer arrangement with fresh spring blooms! This box can be used over and over again! Join us at Charleston's tallest rooftop bar and POUR yourself a drink while learning to create a professional spring floral arrangement! Cheers to friendship and spring with your favorite ladies with 70 of the most unique selection of craft beers, wines, cocktails, and ciders in Charleston. It's a Spring Flower Party by Alice's Table! Summer is right around the corner now and flowers are starting to bloom. Join us for our 1st Alice's Table Flower Party and learn how to create your very own flower arrangement like a professional. Call the Girls ... we're going to a Flower Party! Join us at Madison Vine Wines for a night of DIY floral arranging fun! Learn how to create a beautiful flower arrangement. At the end of the night leave with your spring centerpiece perfect for dressing up your spring holiday table! Join us for a flower arranging workshop at the beautiful Market Avenue Wine Bar in historic Ohio City Cleveland! We will be celebrating National Wine Day a few days early with fresh flowers and delicious wines. Guests of Alice's Table will enjoy 10% off that evening's bill at Market Avenue Wine Bar. Fresh & Fun Florals @ Sugarboo & Co.
Join us for a gal's night out learning the art of flower arranging. Enjoy 15% off your in-store purchases during the event! This ticket includes a pre-selected Sugarboo vase, along with complimentary refreshments and snacks! Join us for a fun night out of learning the art of flower arranging and shopping the adorable collection at Swoozie's! Gather around the table for a floral arranging experience to remember. Learn tips and tricks on how to create your own arrangement using fresh seasonal blooms! Grab a girlfriend and learn the art of flower arranging! As an extra bonus, you can tour the Appleford gardens with a glass of wine in hand. You'll leave the evening with your own gorgeous arrangement in hand, perfect for brightening up any home. Join me as we explore the stunning landscape at Farm and Garden in Coatesville. Madeline Frankel, our hostess, will guide us through her spacious gardens and teach us design and planting tricks. You will have access to gorgeous peonies and other locally grown flowers! Celebrate Spring with your all your favorite ladies at The Candle Lab in Lawrenceville! Be ready to amaze your senses with a custom scented candle and floral arrangement created by you! Ticket includes your centerpiece, candle & a local brew or wine. Early arrivals welcome and encouraged. BYOB! Do you have family coming into town to celebrate Memorial Day Weekend? Join us at Catrina's Tequila and we will be making a stunning Red, White and Blue flower arrangement to help you get started with all your Weekend Memorial Remembrance and your Cookouts. Join us at the Eleventh Candle Co at Polaris Fashion Place for a morning of meaningful fun! We will begin by hand pouring our own candles to take home. As the candles set we will put together beautiful fresh flower arrangements to accompany our new candles. Gather at Porches Cafe for a fun filled afternoon of wreath making with Alice’s Table! Let your creative side bloom by making a beautiful herb wreath to adorn your door featuring Carolina lavender & fragrant fresh herbs. This stunning wreath is made with all natural elements and will dry beautifully. Grab your gal-pals for a fun afternoon at the NEW Heist Brewery location! We'll teach you the skills you need to create a fragrant spring wreath with lavender and eucalyptus! Ticket price includes your first brew. We can't wait to create with you! Grab your best friends! Come to eat at the cozy & charming Flower Flat Cafe and stay for the flower workshop. Join us for a fun filled afternoon, learning the tips and tricks of flower arranging. Everyone will go home with a beautiful flower centerpiece! From the South of France to the French bakery and Cafe LA Madeleine, we bring you tasty delights and beautiful blooms. Enjoy the aroma and savour the tastes of fresh baked goods in this charming bakery/cafe while creating a beautiful arrangement to take home and adore. Join us for a flower arranging workshop at the chic Atwood @ Stay Pineapple. We will be celebrating Summer with fresh flowers. Alice's Table guests get 20% off delicious dinner at Atwood before or after their event with proof of ticket purchase. Grab your bestie or your beau and join us at Iron Hill Brewery! Try your hand at a new fun skill to learn the art of flower arranging. Enjoy brews while crafting a beautiful bouquet of seasonal blooms. Take home your gorgeous arrangement or give it to a friend and spread your spring cheer! Learn the art of flower arranging at the Pause Wine Bar! "Sip" back and enjoy a fabulous wine menu. At the end of the class take your centerpiece home in a stylish vase as well as new floral tips and tricks to make you a pro! Springtime is here! Come celebrate it with fresh flowers and friends at Standard Deviant Brewing! Come learn the art of flower arranging and create a beautiful centerpiece for your home! Indulge your artistic side and satisfy your cravings for tea complete with homemade scones! This package includes a tea educational experience, a cup of tea served with scones and cream, along with an opportunity to create a professional-looking flower arrangement! Grab your friends and join us at The Big Creek Winery Tasting Room for a super fun evening creating a beautiful and fragrant Spring wreath! Enjoy a complimentary wine tasting before the event. Guests also receive 10% off their wine purchase during the event! Join Alice’s Table at The Mar Vista for a fun summer centerpiece workshop! Take home your arrangement and floral tips and tricks at the end of the evening. Food and beverages available for purchase. A portion of each ticket sale will benefit paws4people. Click the link for more information! Join us for a night out learning the art of flower arranging. Gather around the table for a floral arranging experience to remember. Learn tips and tricks for successful flower arranging as you curate your own arrangement in a vase. Tons of fun and no experience needed! Join us at the newest Candle Lab location in the Columbus Convention District for a unique night of candle pouring and flower arranging! Join us at Illie's Workshop & Boutique to craft a beautiful wreath full of lavender! Enjoy a glass of wine as you learn step by step how to create your one of a kind wreath. A perfect way to spend your evening! Grab your girlfriends for a fun ladies night out filled with Roses & Rose at Bin 526! Learn how to create a professional spring floral arrangement - Rose inspired - while sipping on your favorite pink wine! At the end of the night bring home your beautiful spring centerpiece and a few tips and tricks! Grab your friends and join us at the newly renovated Waterline inside Marriott Long Wharf for an evening of floral fun! Learn tips and tricks on how to create a gorgeous fresh flower arrangement using seasonal blooms. Experience the art of flower arranging with this South of France inspired floral arranging workshop! Learn the tips and tricks from a floral designer and enjoy some of Catrina's Tequila while you create a stunning Spring arrangement! Foodies & Florals at Eataly! Grab your foodie friends for a floral arranging event at Eataly! Enjoy wine, cheese and salami (included with ticket) while learning the art of flower arranging using fresh seasonal blooms. At the end of the evening, take home your beautiful arrangement in a stylish new vase. Celebrate Memorial Weekend with a Red, White and Blue arrangement all while listening to a Live Blues Band at The Golf Club of Dublin! Enjoy a fun Friday night outside under the tent while listening to the musical stylings of Joey Rauckis. Join us at Athleta, Oak Brook to start your weekend! Bring a friend and have some great girl time, while creating your own one of a kind flower arrangement to take home with you! All guests will receive a promo card for 20% off a full priced item! Grab your friends and join us for "brunches" of fun with The Glenlevit at Midway! Enjoy complimentary brunch and delicious signature cocktails, provided by The Glenlevit, all included with your ticket! Please join us at Pubblico Italian Eatery for an afternoon of flower arranging and delicious food and drink. You will be working with springs best blooms while also being able to enjoy Happy Hour pricing with food and drink specials (exclusively for Alice’s Table guests)! Feeling crafty? Join our Alice's Table event at the amazing AR Workshop. You will paint your monogram on a stylish wooden vase and learn how to create a flower arrangement you will be proud to take home after the event! Learn all about creating a beautiful summertime flower arrangement at one of our favorite places - Picole Pop! Your ticket price includes a fabulous gourmet popsicle and drink! Spend the afternoon making some new friends and enjoying one of the most charming neighborhoods. What better way to Welcome Spring than with a Spring inspired wreath for your front door or inside your home. Made with fresh herbs, not only is this wreath beautiful, but it smells just as good! Bring your bestie or beau and join us for an evening with friends at Williams-Sonoma Cool Springs! Learn the art of flower arranging and browse all of the amazing Spring Entertaining options! At the end of the event, take home your beautiful arrangement and vase as well as any other must-have in-store find! Join me at Park Street Ale House & Eatery in Attleboro for an afternoon of fresh herb wreaths and good drinks & eats! Come create a wreath of fresh lavender, bay leaves and seeded eucalyptus that will last all season long. Enjoy a complementary glass of wine and a 10% discount on food from their delicious menu. Spring into Summer with Blooms and Wine at Heroic Wine Bar. Your ticket includes creating a gorgeous centerpiece with step by step instruction AND a Wine Tasting Challenge (Italy vs. California)! "Sip" back and saddle up at this gorgeous communal table for a creative night out with friends (both new and old). Learn all about creating a succulent arrangement that's perfect for the hot, humid Florida summer! While you are here, bring a friend or two to cool off in Tipsy Cow's homemade ice cream store to try their famous "boozy ice cream!" Spend an evening with friends (new and old) at Edmund’s Oast Brewing! "Sip" back (enjoying your choice of 2 8oz pours included) and learn how to create your own gorgeous flower arrangement to take home using fresh seasonal blooms. Peonies are the party dress of the flower world and we are celebrating with a summer soirée at Scout & Molly's at Market Street Lynnfield! Enjoy complimentary bubbly and bites while you create a beautiful floral arrangement with the prettiest flower in town, peonies! Join us for fun evening of flower arranging at Painted Tree Marketplace! You will learn the art of flower arranging and pick up some up flower tips and tricks. Create a beautiful fresh floral arrangement using seasonal blooms. At the end of the night bring home your centerpiece as well as your in-store finds! Centerpieces & Calligraphy with Sip & Script! Sip, script and arrange with us at City Winery! We are collaborating with the ladies from Sip & Script to bring you a fun filled evening of flower arranging and an intro to modern calligraphy. Sip on world class wine while you create your own fresh floral arrangement and then learn the beautiful craft of calligraphy. Join us at Paper Affair Frisco for a fun-filled night of flower arranging! Bring a friend and learn flower care do's and don'ts while enjoying light refreshments and a glass of wine. You will create and take home your own stunning arrangement made with seasonal blooms! Join us at The Pearl at Sabine Creek for a fun night of flower arranging! Enjoy a complimentary glass of bubbly while you learn some tips and tricks of floral design and create a gorgeous arrangement made with fresh seasonal blooms. Join us at Anchor Barre for a custom Burn & Blossom event! Class will combine the breath and flow of yoga with light weights, pulsing and shaking of barre mixed in. Following class, treat yourself to a glass of wine while learn the art of flower arranging. Join us for this unforgettable Mommy & Me workshop at the Glenross Gatehouse! Mother/daughter duos will work together to create one beautiful flower crown. From there, they will participate in a mini photo session with KLFrost Photography! Grab your friends and join us for a Sunday Funday on the patio at Loretta's Last Call! Learn how to create a beautiful flower arrangement while enjoying country tunes and Fenway views! At the end of the day bring home your seasonal arrangement in a stylish new vase. Join us for a fun & relaxing flower arranging class at Forager Tasting Room & Eatery. Enjoy a beverage of your choice (included with your ticket) and let your creative side bloom! Come join us for a relaxing evening blooming in fun! Learn about the various flowers, tips and tricks on care and the art of flower arranging. Leave the night with a beautiful handcrafted piece to take home or share with family and friends! As school year wraps up, grab your fellow lady friends for a much needed girls night out at Chiara Bistro! During the evening you will learn the art of therapeutic flower arranging. Don't worry...there will be plenty of wine available for purchase, but NO whining! Experience the art for floral arranging with this French inspired workshop. Create your very own unique grapevine wreath with bunches of eucalyptus, lavender and rosemary. At the end of the night, leave with new found skills and an arrangement to display for months. Grab your friends and kick off summer with a fresh flower party! We'll dabble with gorgeous blooms creating seasonal centerpieces while enjoying craft brews. One pint of beer is included in your ticket price! It's summertime and what better time to create a memory! Join us at the awesome Bingham Family Winery in Grapevine. Come sip on some great wine and learn how to make a beautiful flower arrangement! Join us at Tannins Wine Bar for a blooming night out! Celebrate Summer and unleash your inner DIY maven while learning the art of flower arranging. Enjoy a glass of wine included with ticket. At the end of the night, take home your hand-crafted flower arrangement and a few new tips and tricks! June is National Rose Month in America! In honor of the rose, please join Alice's Table for a Royal Rose Celebration at the Waterfall Bar & Grille, Canton. During this event we will learn all about the iconic beauty of the rose as well as complimenting flowers. Let's toast summer together with a night of wine tasting and flower arranging at The Cheese Shop of Salem! Enjoy an expert led Rosé tasting and cheese nibbles while you create a beautiful floral arrangement with peonies and other seasonal blooms. Join Alice's Table at The Lofty Fig for a fun, floral centerpiece workshop surrounded by unique and beautiful gift ideas at their Port Charlotte boutique. Enjoy complimentary sips and snacks and at the end of the evening, take home your fresh new arrangement in a custom vase. Ready to kick off the summer with some Texas sized fun? Grab some friends and head over to Landon Winery in historic downtown Wylie to learn how to create a beautiful flower arrangement. Ticket price includes a glass of award winning Texas wine of your choice! Join Alice’s Table for a Summer kickoff event at Cider Hill Farm. Create a beautiful, seasonal summer floral arrangement in a stunning new vase. Learn the art of flower arranging and leave with a beautiful bouquet and tips to recreate again and again! Take a break from the heat at The Candle Lab in Lawrenceville! After creating a signature candle scent, get lost in a sea of blooms while the wax sets. Enjoy a glass of wine while designing your very own floral arrangement. Ticket includes your centerpiece, candle & a local brew or wine. BYOB permitted! Calling all best friends! Join us on this summer day for shopping local talent, a lively wine tasting and flower workshop at Local Goods Chicago. Everyone will go home with a beautiful centerpiece and flower arranging tips. Attendees receive 10% off their shop purchases! Come celebrate summer a few days early with bright summer flowers and great food and drinks at Greyhound Tavern! Join us Monday, June 17th at 6pm for the ultimate girls night out! Grab your friends, enjoy a drink or two and learn how to create a gorgeous summer flower arrangement. Join Alice’s Table for a fun summer centerpiece workshop down by the river at Board & Barrel! Enjoy an expert led Rosé tasting, the official wine of summertime, while you learn how to create a beautiful floral arrangement. Click the link for more detail! Learn the art of flower arranging at the Yield Wine Bar! "Sip" back and enjoy a fabulous wine menu. At the end of the class take your centerpiece home in a stylish vase as well as new floral tips and tricks to make you a pro! Experience the art of floral arranging with this French inspired Relaxing Riviera floral workshop. Learn new skills, and live a social and creative lifestyle through floral arranging workshops. Wine tasting is included in your ticket! Have you heard about Mane on Main? Bring the girls and join us in the heart of historic downtown Grapevine for a BEAUTY-ful flower arranging workshop at a trendy new hair and beauty salon, while enjoying a glass of complimentary wine. Enjoy ocean views while learning about flower care and arranging skills! Take your springtime arrangement home at the end of the event to start your week off right. All guests must be 21+ to attend. Join us to welcome summer with FoMu South End! Enjoy a special summer treat from FoMu and learn the art of floral arranging with friends. Come create your own work of floral art inspired by Van Gogh's magnificent masterpiece "Starry Night"! Blue hydrangeas, pink roses, thistle and waxflower come together in a swirl of colors that are as magical as the night sky just before sunrise. Welcome Summer! Grab your friends and come join Alice's Table and learn how to design a gorgeous fresh flower arrangement like the professionals! Join us at the newest Candle Lab location in the Columbus Convention District for a unique night of candle pouring and flower arranging. Your ticket includes your unique handmade candle and floral centerpiece. Wine will be available for purchase! Come join us for a fun evening on The Bogey Patio! We will be hosting a floral workshop where you will learn the art of fresh flower arranging and how to create your own beautiful summer centerpiece that you will get to take home. Your ticket includes an appetizer and a glass of wine or beer! Calling all sea dogs! Join Canal Creative Charters and Alice's Table for a 2 hour Brunch Cruise in Buzzards Bay followed by a floral arranging workshop! Space is limited so reserve your spot today! Join us for a flower arranging workshop full of summer blooms! Learn step by step instructions on how to build your arrangement & tips on flower care! At the end of the class your arrangement is yours to enjoy! Flower Crown Party at Applecrest Farm Orchards! Any age is perfect to handcraft a beautiful fresh flower crown for any fairy or pixie! Join us at Applecrest's Ice Cream Shop and create a flower crown for your little one with sparkly ribbons to match! Any age is perfect to handcraft a beautiful fresh flower crown for any fairy or pixie! Join us at Applecrest's Ice Cream Shop and create your own flower crown! Kick back on The Roof, at The Hotel Salem, and enjoy spectacular views of historic Salem while you create a beautiful flower arrangement. Sip on a hand crafted cocktail (available for purchase) with friends and learn the tips and tricks of floral arrangement! Join us for fun evening of flower arranging at Waterside Pavilion! You will learn the art of flower arranging and pick up some up flower tips and tricks. At the end of the night, take home your stunning arrangement! Join Orchard View Lavender Farm and Alice's Table as we celebrate summer! Pick your own fragrant French lavender bundle in the gorgeous field, learn the tips and tricks of floral design and create your own lavender-inspired, summer flower arrangement to take home. BYOB and lite bites will be provided! Summer is here and time for some fun! Join me at Bridlewood Golf Club to learn all about flowers, how to take care of them and how to create a beautiful arrangement. No experience necessary - you're sure to have a great time and take home your beautiful creation. Join me at the wonderful Hillside Country Club to create your own fresh herb wreath! You will learn how to make your own 14-inch custom wreath to take home and show off on your front door all season long! Nothing says summer like a beautiful bouquet bursting with bright yellow sunflowers. Grab your besties and join Alice’s Table for a fun night out at our sunflower arranging workshop. Your ticket Includes complimentary tour & exclusive tasting of Cider Hill Cellars, plus a 10% off coupon for blueberry picking! Grab your friends and join us at Chiara Bistro for a sizzling, seasonal inspired flower arranging event! Our heat wave colors echo those of the summer sun and pink evening sky. It's sure to be the perfect night out enjoying chilled cocktails, while learning all the floral tips and tricks. Bloom & Burn! Meet your crew at The Candle Lab in Lawrenceville and design a custom scented candle. While the wax sets, and with wine in hand, learn all the tips and tricks to design a floral arrangement of your own. Ticket includes your centerpiece, candle & a local brew or wine! Join Alice's Table for this VIP event at the beautiful West Elm, at the Scottsdale Quarter! We will be creating a beautiful centerpiece while learning all of the flower tips and tricks of the professionals! At the end of the class you will relieve a 15% discount to shop! Come in from the heat and enjoy a relaxing summer Sunday evening with us. We will be making a fresh floral arrangement with a Pear accent all while tasting the beautiful floral and fruit notes of wine from Susec Winery. The Club's Chef will be preparing a cheese and charcuterie board to "pear" with it all. In honor of peach season, Alice’s Table will be hosting an elegant peach color inspired floral arranging workshop. Includes complimentary tour & exclusive tasting of Cider Hill Cellars, a unique orchard to bottle cidery, plus a 10% off coupon for peach picking at Cider Hill Farm. Party like a pineapple! Join us to make your own pineapple vase, then learn how to flower arrange workshop at the chic Atwood @ Stay Pineapple. Alice's Table guests get 20% off delicious dinner at Atwood before or after their event with proof of ticket purchase. Join Alice's Table at The Waterfall Bar & Grille to learn the art of floral arranging. During the class you will work with seasonal blooms and learn new floral tips and tricks. Join us at Trove Warehouse in Upper Arlington on Thursday, September 12th from 5:30-7:00pm for a night of fresh flowers, fabulous furnishing, and sweet refreshments! In this workshop Alice’s Table will guide you through all the basic steps of making a fall floral centerpiece. Join me as we explore the stunning landscape at Farm and Garden in Coatesville. You will go home with new friendships, knowledge of flowers and your centerpiece! We will serve refreshments and snacks, byob if you wish! Embrace the fall season with a fruit n’ floral flower arranging workshop at Cider Hill Farm. That’s right, Alice’s Table will be infusing farm fresh fruit into our lovely floral arrangements. Includes complimentary tour & exclusive tasting of Cider Hill Cellars, a unique orchard to bottle cidery, plus a 10% off coupon for apple picking at Cider Hill Farm. Join me at Bridlewood Golf Club to learn how to create a beautiful fall wreath. No experience? No problem. I'll teach you step by step using natural elements to create that one of a kind wreath. Sign up soon as this event will fill up fast! Join Alice’s Table at Cider Hill Farm and create your own fall wreath, full of warm fall colors. Includes a complimentary tour & exclusive tasting of Cider Hill Cellars, a unique orchard to bottle cidery, plus 50% off coupon for farm tours. Join us for a flower arranging workshop at the chic Atwood @ Stay Pineapple. Learn the art of flower arranging and take home your gorgeous arrangement! Alice's Table guests get 20% off delicious dinner at Atwood before or after their event with proof of ticket purchase. Harvest Grapevine Wreaths at Tualatin! Celebrate harvest time with a fall wreath workshop! Together we will use fresh & dried floral elements to create the perfect wreath for your fall decor. Enjoy wine tasting from Willamette Valley Vineyards at their beautiful Tualatin Estate Vineyard and charcuterie! Join us at Trove Warehouse in Upper Arlington on Thursday, November 21 from 5:30-7:00pm for a night of wreath making, fabulous furnishing, and sweet refreshments! In this workshop Alice’s Table will guide you through all the basic steps of making a fall harvest wreath. Looking for a show-stopping floral arrangement for your Thanksgiving feast? Join Alice’s Table at Cider Hill Farm as we create a fall floral arrangement with a special farm twist, pumpkin vases! Includes complimentary tour & exclusive tasting of Cider Hill Cellars, a unique orchard to bottle cidery, plus 10% off coupon for holiday wreaths. Join us at Trove Warehouse in New Albany on Saturday, November 23rd from 11:00-12:30pm for an afternoon of fresh flowers and fabulous furnishings! In this workshop Alice’s Table will guide you through all the basic steps of making a fall floral centerpiece for your holiday table. Join us at The Waterfall Bar & Grille and start your holiday season off right with fresh evergreen wreath decorating! Grab your friends and create a custom wreath, perfect for bringing some holiday cheer to your home all season long! Sip on a glass of hot cider and munch on warm donuts while you let your creative side bloom. We will craft a gorgeous custom wreath to add farmhouse chic and holiday cheer to your home all season long! Includes complimentary tour & exclusive tasting of Cider Hill Cellars, a unique orchard to bottle cidery, plus a 10% off coupon for Cider Hill Farm store. Please join Alice's Table as we kick off the holiday season with a Fresh Evergreen and Eucalyptus Wreath class! We will be creating this fresh wreath from an evergreen base and adding all of the wonderful Eucalyptus varieties to the wreath to create a wonderful smelling holiday decoration! Celebrate the Holiday Season with a fresh evergreen wreath workshop. We will be taking a fresh evergreen base & adding seasonal greenery & berries to make it a showpiece! Wine tasting & charcuterie included. Plus receive $10 off your wine bottle purchase on event day! Join us for a holiday wreath decorating at the chic Atwood @ Stay Pineapple. Learn the art of wreath decorating and take home your gorgeous wreath! Alice's Table guests get 20% off delicious dinner at Atwood before or after their event with proof of ticket purchase. Celebrate the Holiday Season with a fresh evergreen wreath workshop. We will be taking a fresh evergreen base & adding seasonal greenery & berries to make it a showpiece! Wine tasting & charcuterie included.